These noise measurement kits include a Sound Level Meter that was designed specifically for environmental noise measurement. The meter meets the sound level meter standards to Class 1 and makes all the measurements required by most such surveys, including the periodic LAeq and the statistical Ln parameters (L10, L90, etc). This version of the outdoor kit (order codes WPK171B and WPK172B) include a version of the Optimus Green sound level meter with 1/3 octave band filters, making it ideal for measuring noise that may have a tonal content. For most 1/3 octave band environmental noise surveys we recommend the WPK171B Outdoor Kit. This is a Class 1 meter with real-time filters, automatic timed measurements and audio recording. For more details please see the Which Meter tab. Tonal Noise to ISO 1996-2? The sound level meter included in this kit is suitable for almost any noise measurement application, not just environmental noise, as it exceeds the requirements of most regulations such as those covering occupational noise. If you have additional applications as well as your environmental noise monitoring then these meters will usually be suitable for that too. For medium term noise monitoring in and around sites during construction and demolition work. For longer term monitoring we recommend the EM2010 Environmental Noise Monitor. For monitoring over a few weeks or months the Outdoor Kit should be ideal. The kit can be set up at a suitable location and left to run for a week. At this point you can take it back to the office to download and recharge, or take a laptop out along with a recharged batteries to swap (additional batteries are not included). The noise measurements required on construction sites tend to include the periodic LAeq and LA90. For short term and mobile boundary noise monitoring, this application is very similar to Construction Noise (described above). Noise limits may be set by a local authority, demanding that noise levels be monitored 24 hours around a site, sometimes at multiple locations. The measurement of LAeq and LA90 is normally required. 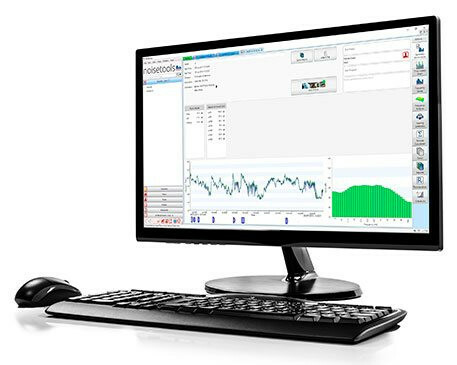 Longer term monitoring at fixed locations can be achieved with the EM2010 Noise Monitoring. The Outdoor Noise Kit can be easily relocated, making short term (up to one week) measurements at multiple locations much easier. Monitoring the noise at the roadside or by rail links or airports usually demands the measurement of the LAeq, LA90 and LA10, all of which are carried out simultaneously on the Optimus Green range of meters, as included with this kit. The meter in this kit includes real-time 1/3 octave band filters. Along with 1/3 octave band summaries, this meter also stores a time history of the spectra, giving the ability to analyse the noise for specific periods of time. For more information about the measurements made please visit the Optimus Green with 1/3 Octave Band Filters page. For automatic tonal analysis in line with the ISO 1996-2:2007, please see the WPK171C Outdoor Kit with Tonal Noise Detection. All the WPK17xx outdoor kits come with an Optimus Green Sound Level Meter. The WPK kits on this page include either the CR171B Class 1 meter or the CR172B Class 2. Most applications demand the Class 1. You can read more about the meter itself on the Optimus Green with 1/3 octave band filters page. If your application does not require checks for tonal noise then you probably don't need the 1/3 octave band filters. These filters split the spectrum up into 30 or more bands, giving a nice visual display of the frequency content and the ability to analyse the noise in more detail. If you don't need these filters then please see the Standard Outdoor Kit option. You can always add filters at a later date if needed. While this meter makes all the measurements needed for a tonal noise analysis to ISO 1996-2:2007, you may find it easier and quicker to have a meter with the Tonal Noise Detection module fitted. This uses the 1/3 octave band filters to automatically carry out the calculations in line with ISO 1996-2:2007, or with a customer method. For automatic tonal analysis please see the Outdoor Kit with Tonal Analysis page. Monitoring noise with a tonal content may also require measurements using 1/3 octave band filters, which are included with this kit. Some applications need measurements of these acoustic parameters over curfew periods, so for example between 11pm at night and 7am in the morning. The meters we recommend for use with the Outdoor Kit include all these parameters, and many more. Automatic, repeating timers can be configured to make measurements over preset or custom periods. These would usually be set to 5 minutes, 15 minutes or 1 hour for environmental measurements. Timers are included with this meter. As well as the periodic summary measurements the meter also stores a time history noise profile. This can provide a graph of sound level over time and is a good way to pick out noisy periods. The meter in this kit also stores a time history of the 1/3 octave band spectrum for further analysis or the production of charts. The meter can be set to store time history samples at a rate of 1/100s to 2s. Once downloaded to the software (which is included) you can plot graphs of the sound level over time and recalculate certain noise parameters. Before starting a measurement you can record VoiceTag audio notes, which in some environments is easier than writing things down. These are stored on the meter and can be listened to after downloading the measurements. The meter is also capable of recording the audio during a measurement. These recordings can be threshold triggered based on the sound level, making it much easier to identify the cause of high noise levels when the monitor has been left unattended. The outdoor noise kit includes the NoiseTools software - there is no extra charge for this. You can download the software to evaluate it before making a purchase. The main option with this kit is whether to have Class 1 or Class 2. A Class 1 meter is more accurate than Class 2, as defined by the various sound level meter standards such as IEC 61672 and ANSI S1.4. Most environmental standards suggest the use of a Class 1 meter. Class 1 meters are also often provided with a more sensitive microphone capsule that is better for use in low noise environments.